I’ve written enough on Europa Universalis IV over the past year that you don’t need me to lead you into this review. 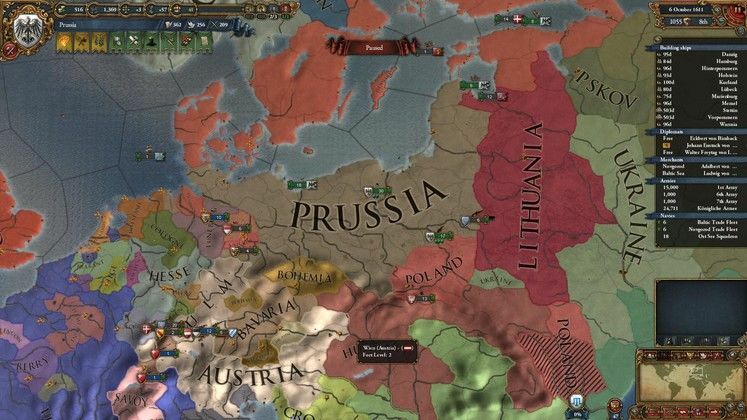 To be honest, I imagine you can guess what the verdict is going to be –is Europa Universalis IV any good? Of course it is. 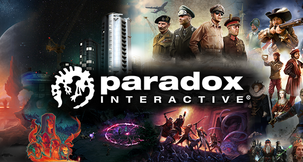 It’s fantastic, brilliant even, and easily Paradox’s best game since they released Crusader Kings II in 2011. 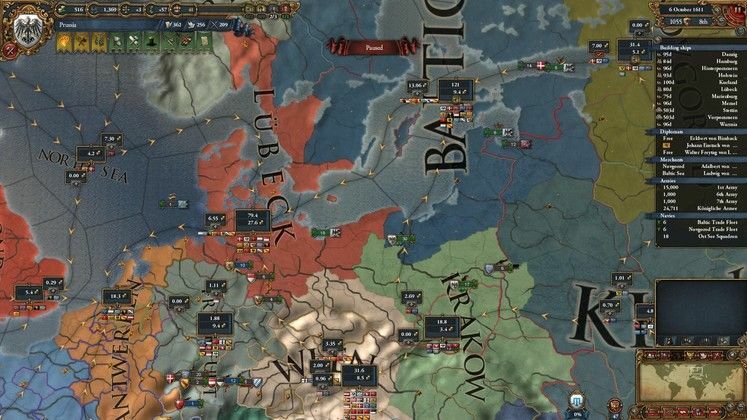 Granted, it’s not as accessible as the medieval-politics sim, but compared to the previous version of Europa Universalis this is a far superior offering. 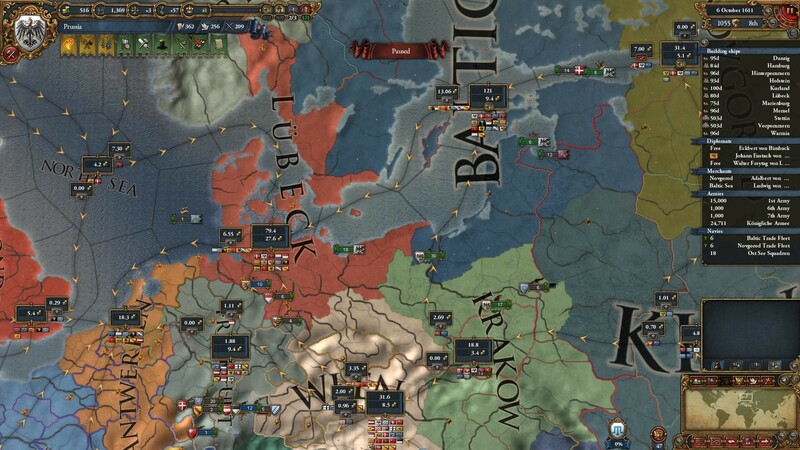 I’ve put over 80 hours into various versions of EUIV, and it’s been interesting watching the game grow and evolve over the various betas. Some bits have improved for the better, others have stayed the same. So, what do you want to know? In my last preview, I talked a lot about the Trade and Colonisation elements of the game. All in all, not much has changed there. For smaller nations who won’t have much population to tax, or much of an industry for the production of goods, Trade is a life saver. The fact that you can actively manage it means that you feel like you’re doing something genuinely useful. The only real downside to the system, which they haven’t managed to improve on, is transparency and feedback. The game is supposed to start you with your merchants already placed in their optimum position(s), but things can change over time. Nations rise and fall, one nation or another gets more control over this node or that node… apart from the Trade Region where your capital is located (where you should always have a merchant collecting), the best region with which to steer trade towards your home region can change. It’s not always obvious whether your choice is the ‘most’ profitable choice available to you, so be prepared for some experimentation and/or number crunching. There are many faces of Europa Universalis IV, and the greatest thing is that you can guide your country down the path YOU choose. Granted, a lot of this will depend on who you play as and what happens around you, but there’s still a lot of choice. Also – you’ll probably end up doing a lot of fighting, one way or another. Central Europe is a power keg of conquest, revolution and re-conquest... unless you’re on the periphery, it’s sometimes hard to stay clear of it all. Your allies are just as likely to drag you into a war as someone is to pick on you, so don’t make friends likely. Overextension & aggressive expansion penalties stop military expansion from getting out of control, and forces the player to pace themselves. 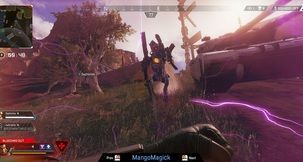 If you’re lost for a target, the game will generate ‘missions’ for you, which are short-term goals that follow diplomatic, economic, or militaristic lines, and they offer a viable target for you (and choosing the mission will provide you with the a claim, saving you the trouble of doing it yourself). There is still a mid-game ‘hump’, where you’re not sure what to do with yourself and you’re just expanding for the sake of expanding. This appears unavoidable, but manageable. 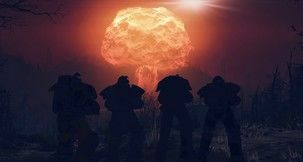 As things start progressing forward and the ‘major’ players really begin to arise, you find yourself entering a more global game of intrigue and diplomacy. 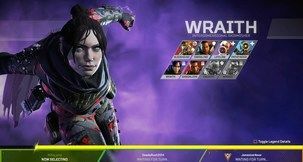 Also by this point a lot of the unknown portions of the map should be revealed to you, assuming you haven’t gone and sought them out already. You should be able to get some colonies going (or take someone else’s), so the end-game takes on a whole new dynamic. If you go for colonisation straight away, then eventually you’ll have to contend with the other European powers trying to muscle in your turf, and if you’re unlucky there may be a revolution or two to contend with as well. 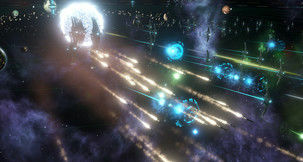 Worth mentioning this time around is the multiplayer – Paradox have completely rewritten their back-end, and have integrated the game heavily with Steam’s online service. Finding and setting up a match should be relatively painless, and we’re happy to announce the Hotjoin (from what we’ve been able to test) works pretty smoothly as well. 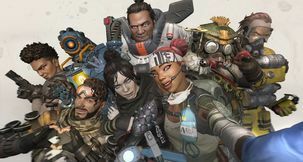 With multiplayer matches poised to become the norm, over the exception, we urge you to take this online wherever possible, even if you don’t have that many friends who have the game. The intricacies of the local trade network – where is the best place to be? It’s worth bearing in mind that this game is called Europa Universalis. 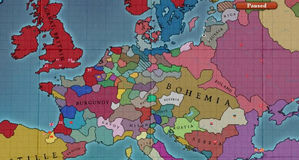 Much like how CKII focused on European Christians for launch, EUIV has an initial focus on Western Europe. Some love has gone to the other major players around the periphery – the Ottomans, for example, are recommended for new players, and you have all the goings on with the pre-Russia nations, the Mongol Khanates, and that areas. There are also some Native and South American tribes you can play around with, and you of course have the Indian peoples, China (and the far east) and Japan. Most of what’s important to the game though happens in Europe, so Europe is where there is the most challenge and flexibility. That’s not to say that going elsewhere isn’t more enjoyable – India, for example, is a more straight forward game of conquest and diplomacy to begin with, as there’s less players and less variables to worry about. Same goes for Japan, and China is pretty much dominated by the Ming Dynasty, which is represented as one huge nation on the map. 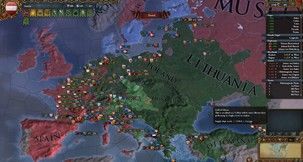 So, Paradox have done it again – learning from the design of Crusader Kings II, Europa Universalis is an excellent starting foundation. From here, we hope the game receives the content and support that CKII got, and we can’t wait to see what else they can do with the game. EU3 fans are obviously going to feel right at home here, and whilst we’d encourage newcomers to try it out, since there’s no ‘face’ to game (As it’s about nations, not people), it might not seem as inviting. Once you’ve played one Paradox game though, you’ve played them all, so if you want to start with CKII first, don’t hesitate to play this one as well. You won’t regret it. Coming out ahead when you know you should have lost badly is always satisfying.